Take a hot bubble bath. The soothing suds and warm water can wash your cares away while relaxing your tired, aching muscles. To enhance the healing effects, turn on some soft music and just daydream the night away. Bath and body gift baskets can be delivered by mail right to her front door. Every woman loves to be pampered and the best way to pamper her is to send her a luxurious bath and body gift basket. 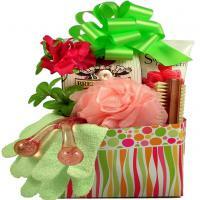 Give the gift of relaxation to every special woman in your life with elegant spa baskets by Adorable Gift Baskets. Bath and body gift baskets include products for ultimate enjoyment and rest such as aromatherapy candles, lush bath towels, candles, massaging products, bubble bath, body mist, body butter, bath oil, body scrub, and lotion. These gifts can help her unwind after a tough day at work or busy day at home. 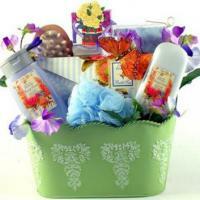 Spa gift baskets for women and relaxing, stress relief bath & body gift sets are a woman's favorite gifts. Women love to receive relaxation gift baskets filled with luxurious aromatherapy scents and soothers. Luxury spa baskets by Adorable Gift Baskets provide you with all the accessories you'll need (bundled in gorgeous arrangements) to fulfill your spouse's every desire on your wedding anniversary, her birthday, or even on Valentine's Day. If she already owns plenty of luxury spa and bath products, try one of our bath and body gift baskets containing foot massage necessities. Help her relax her feet a while with foot bath and gel, foot cream, a foot brush, and other soothing items. Besides, when her feet feel wonderful, this will create a serene feeling in her whole being. A bath and body gift basket delivered to her office will make her the envy of her friends. And you don't need a special occasion to express your love. Pick a day when she least expects it and have the bath and body gift basket delivered along with a lovely floral arrangement and a card - just to say "I love you!" She'll treasure your gift - and you - for a lifetime. Adorable Gift Baskets also provides a variety of bath and body gift baskets for Mother's Day, the holidays, get well gifts, gifts of thanks, friends, loved ones, co-workers, and others. Luxury spa baskets are great for a new baby greeting to help the mother relax and enjoy her time at home with the baby. With our easy shopping methods and fast, affordable shipping, you'll discover endless ways to show you care with bath and body gift baskets. Browse our selection and choose baskets that are creatively packaged with all the spa essentials your wife or loved one will adore. 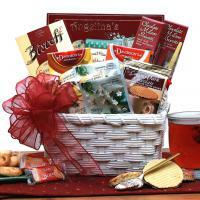 Relaxing Gift Baskets, Stress Relief Gifts, Relaxation Therapy. Pamper spa gift baskets are the perfect way to say "I love you," or "I'm thinking about you" to someone in need of a little rest and relaxation. When you want to share your love with the woman in your life, whether it's your wife, girlfriend, or even your mother, Adorable Gift Baskets for women offer a wonderful, easy solution. She'll adore our elegant gift basket arrangements garnished with fine merchandise and goodies to make her feel like the special woman she is. Every woman loves to receive pampering gifts that say Thank You, I Love You or You're Special. Choose from relaxing spa baskets and lovely gifts for every special woman in your life to show her how much you care.